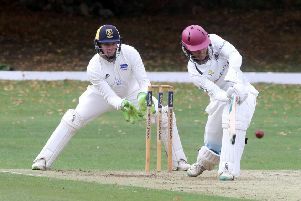 Old rivals Finedon ended Peterborough Town’s Northants Premier Division title challenge last weekend, but the real damage was done by lesser sides according to frustrated skipper David Clarke. Town lost a crucial toss at Finedon on Saturday (September 9) before slipping to just a third defeat of the campaign. Paul McMahon's availability for Peterborough Town will be limited next season. That result and Old Northamptonians’ rapid nine-wicket demolition of Oundle means the best Town can achieve is a third straight second-placed finish. “We didn’t lose the league on Saturday,” Clarke insisted. “The defeats earlier in the season against Brixworth and Rushden ultimately proved decisive. We beat and drew with Old Northamptonians, we played well against (second-placed) Rushton and we beat Finedon at our place. Town were dismissed for just 107 at Finedon. The home side eased to a six-wicket win . “It was a really bad toss to lose,” Clarke added. “Conditions were perfect for bowling, but to be fair they also bowled extremely well. Everyone struggled to get any momentum with the bat. It was hard work for us after we lost our in-form players quite early. Town finish their Premier Division season at home to Geddington on Saturday (September 16, 11.30am) before re-building for the 2018 summer can start. Professional all-rounder Paul McMahon, a huge success in his six seasons at the club, will have limited availability at best next season because of work commitments. Old Northamptonians dismissed Oundle for 67. They need a point from their final game at Rushton to retain their top-flight title.